I went running yesterday with my sweet friend Holly. She has a son, Jace, who just turned three. He came along too in his running stroller. Holly is always working on her fitness, and I can be her witness when I say.. pushing a running stroller is some kind of work. I had told her to begin that I would be glad to help push because we would be running a few good hills. She let me push that sucker for a couple of miles and it is a whole different work out in itself. So props to Holly for getting double the work out that I do on a normal run. Maybe I'll go buy one and fill it with books.. or Betsy. The past two weekends have been incredibly uneventful. No plans, just working around the house, cleaning, organizing, and cooking. I shouldn't say cooking, but I have been learning the ins and outs of my trusty crock pot. It was simply a space thief for the last three years, but it has been in full use the last two weeks. Mr. Broome won't complain either; he's enjoyed the last few meals from it. I like fresh food too, but the weeks can be so busy. Sometimes throwing chicken the crock pot is too easy, especially knowing I can use it for salads or wraps for the rest of the week. I've been enjoying fall candles, Pumpkin Spice, to be exact. I wish Fall we're a permanent season. I could live in fall all year and you wouldn't hear a complaint from me. I've already pulled out my pumpkin displays and scarecrows. Andy and I went to Home Depot Saturday on a mission for pine straw. Secretly I was eager to get my hands on a few pumpkins, but there were none to my dismay. You would think as eager as stores are to get you in the Christmas spirit, ie. Hobby Lobby has rows of Christmas stuff 50% off NOW. they would surely have pumpkins mid- September. Bah, humbug! So, I live in a town with zero shopping, and when I come across a good find at TJ Maxx, I find myself calling everyone in my contact list.. and posting it for you all to see. 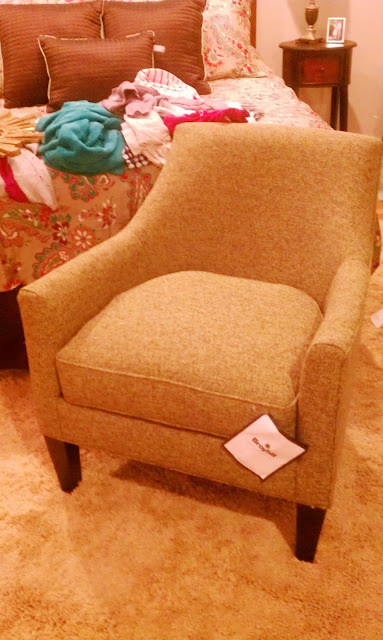 This adorable green tweed chair was $65. I was a little excited, though unsure of where it would fit in our home. It has found a place in our bed room. I saw this chair there! I liked it.